I teach entrepreneurs and creative professionals how to sell with creativity, authenticity, and fun. I help my clients clarify their brand message, so they can make money with their ideas. Hi Meghan, I would like to speak with you briefly to see if you're a good fit to coach me. Please contact me at your earliest convenience. 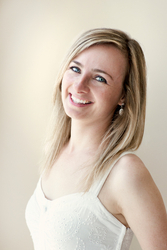 Meghan Mackintosh is a creative sales expert, brand strategy coach and yoga teacher. She’s the creator of "The Creative Business Blueprint". She believes that there’s an art to selling, and when done the right way, instead of being sales-y or pushy you become of service to others. Meghan grew up immersed in the arts. She danced ballet and jazz and went to a high school for the performing arts where she studied drama and singing. Her thrill for adventure has taken her to over 20 countries in the world and she has over 10 years experience as a sales and marketing executive for top companies in the TV commercial, entertainment and advertising industries. Her passion lies in teaching creative entrepreneurs how to package and sell their skills and talents, so they can profit with their purpose and make a difference in the world. Meghan earned a Post-Graduate Diploma in New Media Journalism from Sheridan College and an Honours BA in Sociology from the University of Guelph. When she’s not coming up with creative sales strategies and marketing ideas, her favorite pastime is spending time with her three spirited nieces at their family cottage in Southampton, Ontario. You can find me at MeghanMackintosh.com. Have you worked with Meghan? Tell your friends! Meghan doesn't have any reviews yet. Meghan hasn't submitted any articles.